New Year. New Plans. New Resolutions? I just copied my "got-to-review" folder of pdf files from the computer to the Kindle. Maybe that will help me review them faster, since I can carry them around the house with me. I also learned I can write notes while I read on the kindle--that should make it easier to write reviews too, though I'll need the computer to post them. New Year Resolution: Be more organized about reviews--make lists of books and deadlines and sources and try not to overcommit. I'm hoping to finish reading Sage Cohen's The Productive Writer ready to review before she visits my blog (Jan 3rd). I'm really enjoying her writing and her ideas, and mentally preparing challenges for our writers' group's next meeting. New Year Resolution: Be more pro-active leading the writing group. Then I'll have to apply the ideas to my own writing life and plans. New Year Resolution: Be a more productive writer. Maybe I'll make this year the one where I actually keep my resolutions. Once upon a time I "produced" a baby boy. He was a pretty unfinished, unpolished production, and I'd never in my wildest dreams have imagined I could bring into being a man. But I worked with him, and he with me. We pushed and pulled, argued and agreed, approached too close and drew too far away. And now--yes, I know; it's far more to his credit than mine--now he's a handsome, happy young gentleman, pleasant to talk to, comfortable to be around, and steadily ready with his own plans and dreams for a future that's all his. I finished the book I was meant to review before Christmas. It's called Homecoming, by Sue Ann Bowling, and I'll be posting reviews soon. The characters were great and the storyline's really quite intriguing, with fascinating touches of science and ESP. Now I'm reading the book I was meant to review before New Year. It's called The Productive Writer and it's written by the very productive Sage Cohen, who'll visit my blog on Jan 3rd to offer her advice. I'm looking forward to sharing Sage's post, and meanwhile I'd better work on productively reading, in hopes that I might productively write in the New Year. I did send a couple of letters to the paper. Does that count as productive? Does it count if they don't get published? My "sense of time and place" (see previous post) is all confused. Our oldest son went back to Texas this morning--another early alarm to get to the airport. But it's Boxing Day, still part of Christmas; it feels all wrong to think he's gone away. Meanwhile youngest and middle sons play computer games, which reminds me of bygone times when they all lived with us. Then there's the board games--an essential ingredient of Christmas since the offspring learned to spring. Once upon a time I would play with them and say, "No, don't do that." Then I'd show how the move they'd planned was missing some vital point, and I didn't want them to lose just because of a mistake. So this afternoon we played and they said, "Mum, don't do that." Then they showed how the move I'd planned was missing some vital point, and they didn't want me to lose just because of a mistake... I lost anyway. I love to read, and I read almost any genre I come across. I love the sense of different worlds and ideas in historical novels. I love the feeling of "I've been there" in books set in England or the Pacific Northwest. And I love the wild imagination of science fiction. I'd love to write in all these genres too, but I don't suppose I shall. I haven't the patience or attention to detail that history would require. I don't have the confidence to trust my memories of places that really exist. Which leaves sci-fi I guess. Our book group read "Hotel on the Corner of Bitter and Sweet" last week. We all seemed to like it, but some members found the dialog distracted from the story and didn't ring true to their memories of time and place. Our writing group listened to an excellent talk from Myrna Oakley yesterday. She told us how our story-telling plans should start with a location plus characters. And my critique group read and critiqued my newly added sections from my novel, Divide by Zero, also yesterday. I was trying to create a better sense of the main character but the first question everyone asked was "Where and when is this set?" Recognized from my book cover! Still glowing, I'm writing this post with thanks to the dear friend--a real book order, for books by me! Lulu says they've already shipped them, so I'll mail the parcel soon. And it looks like sending them in a priority mail envelope is the cheapest method, just in case you were wondering. Mum likes to shop at New Seasons on a Wednesday. They give you a discount if you're "better than 65," and, as she says, she's much much better. They also sell great gluten-free foods, and Mum loves to buy me treats when she visits here. Today I'd told Mum about my Thanksgiving cornbread, made from a packet, with added cheese and salsa. It was my first ever cornbread success, so we thought we'd try to repeat it. But we couldn't find g-f cornbread mixes anywhere. An assistant came to our aid but found nothing either, so we continued on our way, guessing we were out of luck. Ten minutes later the assistant chased us down in another aisle. "I've found one," she declared. Not only that; she'd found us! So now I can share my gluten-free cornbread with Mum, and we can share our love for New Seasons with anyone reading this. My Mum had pizza and ice-cream for breakfast, or perhaps it was lunch, or dinner, or tea instead. It's hard to keep them straight in your head when you're flying around the world. I gave her a cheese sandwich. My Mum's head's nodding. She'll fall asleep soon, probably not in her bed. It must be time for dinner. My Mum's flown half-way round the world with Christmas in her cases and love in her eyes. Life is good. She's over there resting in her chair, and me, I'm typing, blogging, over the moon. "This lady's selling jewelry. This one's selling scarves. And this one's selling cards and paper things," (otherwise known as books). "Why do they call it a bazaar. Doesn't that mean something weird?" "Let's have some real Christmas music--Grandma got run over by a reindeer and all that." "I didn't bring money of course." Many thanks to all the friends and strangers who stopped by my stall and encouraged me, especially to those who encouraged my family too by buying books :) It's been a fun two days. Black Widow now on sale! I just checked on Gypsy Shadow and my new ebook, Black Widow, is on sale. December 1st seems like perfect timing for Christmas! So if you're looking for a historical read, set in England, with mystical overtones, why not head over there? There's even a sample excerpt so you can see what the story's like. Black Widow: When Boudicca's sister meets the mysterious wizard, it seems like all will go well for the little British kingdom. But Roman peace demands a high price, and the people are starting to follow a foreign priest. Refracted: The story of a young man lost in the fields of time, trying to remember what he thought he was looking for. I'm the one that's gluten-free. The son that lives with us is vegetarian. And with only three of us at home this Thanksgiving, only two of whom are carnivores, we decided to try for a gluten-free vegetarian Thanksgiving dinner menu. High point: This time I didn't make a black bean casserole that looked like a loaf of cornbread piled on top of a can of beans. It took a while before I realized Black Friday referred to future shopping, not some dire historical event. Having learned, I decided not to participate--there must be better ways to work off those calories than going to war with the neighbors. Meanwhile the internet was full of sites advising "Shop Black Friday deals from the comfort of your own home," conveniently forgetting the internet would reduce to a blank screen on Thanksgiving--well, blank screen with tiny icon saying "waiting for something.something.ad" while you wait for "something.com." Still, Amazon's advertised deal on Black Friday Kindles was certainly enticing--would my scruples (and internet) hold me back, or would I try? WooHoo! Black Widow has a cover! I just got my first look at the cover for Black Widow, coming soon from Gypsy Shadow Publishing. Look at that black and red--perfect for a black widow spider--and the blue man's slowly succumbing to her web, or her to his. That red and gold makes me think of Christmas too, and it sounds like the book will be out in time for the season. What a wonderful Christmas present for the computer, e-read for the cook, and sheer delight for me. I'm still catching up on posting my book reviews for that reading journey. These are the action adventure tales I've read in the last couple of weeks, and scroll down for literary fiction--my favorite. The Capablanca Variation by Douglas Quinn: Charlie's Angels meets James Bond--world-traveling agents steered by a behind the scenes chess-master; death, mayhem and destruction. The Electric Church by Jeff Somers: dystopian science fiction; dark world; scary technology; and great fun. Shadows from the Past by Ashley Dawn: Christian suspense with lots of backstory and description. Former friends thrown together in the hunt for a murderer who's got them both in his sights. The Reckoning by Howard Owen: A teenager comes of age, tied down by his father's own coming of age during the Vietnam war, and threatened by loss. A surprisingly powerful tale that stays with the reader long after the last page is turned. These are the childrens' and young adults' books I've read recently on that reading journey... Fun reads for a Saturday morning while rain drips outside. Inkdeath by Cornelia Funke: I'd been waiting to get this in paperback for a while. I love the series, just not quite enough to shell out for a hardback. And this was a very fitting conclusion--best yet in my estimation. My Sparkling Misfortune by Laura Lond: With an evil anti-hero narrating his fall from wickedness, this one's great fun and told in a really enjoyable voice. The Unwanted by Daniel Carter: Genetic engineering, faith, superheroes and the FBI combine delightfully. Looking forward to more in this series. The Royal Dragoneers by M.R. Mattias: A well-crafted world with rich detail and vivid descriptions, interesting characters and an enjoyable storyline. Continuing to list those books I've been reading recently, here's some scary ones for when that rain turns to howling winds tonight... As usual, if you click on the links you'll find my reviews on gather. Friday the Thirteenth, by M. Flagg: Humanity's more dangerous than the jungle, so she chose Manhatten; a fun little scary romance. The Eyes Have it, by Denise Bartlett: An intriguing lunch-time read with a green-eyed sting in its tail. Vow of Superstition: Dragon's Blood, by Skhye Moncrief: A fascinating world, with dragons, and a drink of dragon's blood to seal a young woman's fate. Witches, Werewolves and Jack the Ripper, by G.M. Jackson: a cool scary story that looks at the Jack the Ripper story from some very interesting points of view. I used to ask way too many questions as a child, though surely not as many as my own children. My Gran would silence me by saying "'Cause y's not z," and my Granddad would ask, "How long's a piece of string?" I'm hosting a Second Wind Publishing discussion on Facebook and Goodreads where I ask how long's a novel, novella, novelette, short story, etc... and invite you to to wonder where dribbles and drabbles and chapters and blurbs fit in. I think my biggest conclusion so far is I'm still not sure if my e-book's a short story or a novella, but I'm convinced I'd find it harder to sell as a short story. Somehow short, and pay real money for it, don't quite fit together. But what do you think? It seems like a while since I posted a list of reviews. I think I must have been distracted by something. I think I'm still distracted--runs round the room. And no, the housework's not getting done; at least, not just now. But the contract's been sent and I really need to get down to reading and writing. As usual, if you click on the links you'll find my longer book reviews on gather. Murder in Winnebago County, and Buried in Wolf Lake, by Christine Husom: Two murder mysteries set around the very likeable and believable Sgt. Corky Aleckson, with a very authentic feel, down-to-earth characters, and villains that are scarily real. Then I drove to the post office and with quivering fingers signed the check and sent five books and one contract off. ...and I'm still dancing round the room! I've reread it a thousand times, and shown it my husband and son. It's not likely to change. But it's got my name and the name of my novel on it. So I'll get my husband to check it before it goes out. But the address is online, on the contract and in the email; I've lots to chances to make sure it's right, and my husband will certainly help. All those irrational fears are jumbling around in my head. Just sign the contract and get it sent back and STOP WORRYING! I used to dream about how it might happen. A phone-call maybe. A letter that didn't begin "If you sent a stamped addressed envelope we are returning your manuscript." Or an email of course. But the emails always begin, "Thank you for your query... but..." And that's what I thought this email would be when I clicked on it. "Thank you for choosing... After careful consideration... I would be pleased to extend an offer of publication to you..."
I jumped out of my seat. I shrieked. My son, after first confirming I wasn't in pain, said, "Did you just get an offer?" Then I demanded he, and my husband, read the email just to be sure I wasn't somehow inventing words that weren't on the page. I just got an email about "The Official Indie Book Reviewer List," a sort of Yellow Pages of book reviewers who are interested in small-press and self-published books, and review them free! It sounds a wonderful resource. Christy Pinheiro is offering it as a pdf file for just 99 cents, and I'm thinking I really ought to buy it. But while I'm thinking about it, here's a link so you can think about it too. Contact information, submission guidelines, likes, dislikes, pet peeves... what more could we indie writers want? My eBook, Refracted, is in the spotlight over at A.F. Stewart's "In the Spotlight" blog today. It's a beautiful site, spotlighting lots of wonderful books and authors; I'm honored to be in such good company. There's an impressive Amazon associate page too where you can find links for purchases. I'm really grateful to A.F. Stewart for spotlighting me, and I hope you'll all go over there and browse the various posts. Instead I'm dusting, polishing, cleaning words. I got an email from a publisher yesterday. They want to see the whole manuscript of my Young Adult novel!!!! Yes, I know it doesn't mean they're going to say yes, but it's one step higher on the mountain of dreams. Please wish me luck, and well-dusted, well-polished words. Meet Anjuelle Floyd, and win a kindle! To celebrate the release of her novel, The House, author Anjuelle Floyd is offering a (1) Kindle Wi-Fi (retail value: $139.00) as a part of her promotional blog tour. I'm delighted to have Anjuelle as a guest on my blog today, where she is giving a fascinating character sketch of Edward Manning from her book, and answering the question "How does a writer come up with her characters?" See yesterday's post for more information about Anjuelle Floyd and The House, and don't forget to read to the end of this post to find out how to win a Kindle! Have you ever wondered how a writer comes up with her characters? Author Anjuelle Floyd provides a peek inside the profile of her dying character, Edward Manning. Anjuelle Floyd visiting my blog tomorrow--chance to win a kindle! 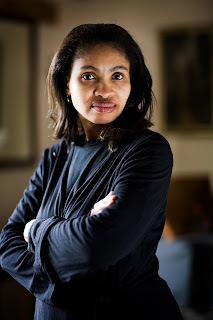 Author Anjuelle Floyd will have a guest post on my blog tomorrow, which I'm very much looking forward to. To celebrate the release of her novel, The House, she's offering a (1) Kindle Wi-Fi (retail value: $139.00) as a part of her promotional blog tour. A WINNER WILL BE ANNOUNCED DECEMBER 1, 2010, so don't forget to visit tomorrow and find out how to enter. Meanwhile, here's some information about Anjuelle and The House. About the Author Anjuelle Floyd is a wife of twenty-eight years, mother of three, licensed Marriage and Family Therapist specializing in mother-daughter relations and dream work. 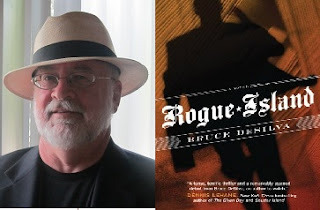 I'd like to welcome author Bruce DeSilva to my blog. His Book, Rogue Island, has been getting some rave reviews, and is touring the internet at the moment. I was delighted to be asked to be part of the tour. Bruce DeSilva offered to write a guest post here, so I asked him my favorite question, little realizing what a great read his reply would be. My question: Please would he tell me something about his journey from there (unpublished) to here (published and racking up the 5-star reviews). His response... well, you'll have to read on. Meanwhile he's offered to drop in from time to time during the day to answer any other readers' questions. Over to you Mr DeSilva... Way back in 1968, as I trotted off to college to major in geology, my favorite high school teacher made a prediction: I would soon find myself writing from compulsion. I have two authors visiting my blog over the next few days. 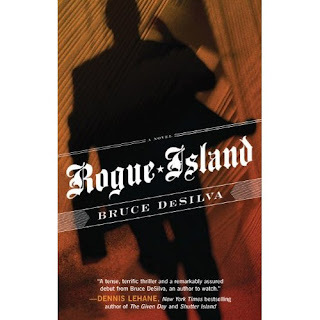 On Friday, Bruce DeSilva, author of Rogue Island, will be talking about (my favorite question) how he got from "there" to "here." In his case, "here" is an author blog-touring the internet with a fantastic book that's already got tons of rave reviews. I'm so lucky to have him visit here, and I know his story will be really interesting. Then next Monday Anjuelle Floyd will be visiting. 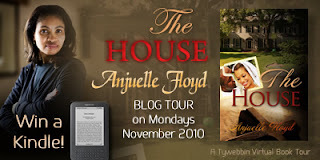 To celebrate the release of her novel, The House, author Anjuelle Floyd is offering a (1) Kindle Wi-Fi (retail value: $139.00) as a part of her blog tour. A WINNER WILL BE ANNOUNCED DECEMBER 1, 2010. Okay, I finally took the plunge. I clicked that "view in Google reader" button on my blogger dashboard. Then I made a coffee while it loaded--it seemed to take forever but only 'cause it had so many blogposts to compile. Then started to read. I shall certainly read way more blogposts now I'm using Google reader; it's so neat, just scrolling down the page reading them one after another instead of having to click. But I'll leave fewer comments I suspect since scrolling back to the top of an article to open, then back to the bottom to comment, then...--well, it just takes a a bit more decision-making effort when I'm already absorbed in the next interesting post. I'll get better at it I expect, learn to open some posts in a window before I read... something. I tried to follow a new blog today but a red-framed message popped up and wouldn't let me pass. It seems I'd reached my 300 limit, not that I'd remembered I had one. So now I have to "unfollow" some blogs before I can follow more. Meanwhile, there's that interesting question: Just how do you "unfollow" a blog? It's easy if there's a blogger navigation bar on top--just click on "Follow" and choose "Stop following." But so many blogs either don't have bars or weren't even made with blogger, so what about them? It seems that Lulu and HP have produced a print-on-demand machine that looks kind of like a large photocopier. Books uploaded and designed in a special section of Lulu can be printed on the spot with no long waits or shipping costs. Portland State University Bookstore is one of three locations trying out these "publishing machines." Professors can provide tailored text books at a fraction of the usual price, and test out the content before committing to the expense of traditional publishing. A 300page novel will cost around $12; a 100page book with color illustrations around $18... And, if I'm reading the article correctly, real people will really be able to publish there. Erin O'Riordan, author of Beltane, Midsummer Night, and other books and short stories, has written an amazing review of Refracted on Gather. I'd have enjoyed reading the review even if it wasn't for my own book, and I get goosebumps as she tells me what associations my story invoked for her. Thank you so much Erin! Thank you more than I can say! The Muse conference is so.... so good. I'm loving it. Of course, the homework takes lots of time, and the housework's not getting done. Dear son says no problem; he can't see the difference. Still, I did cut the grass yesterday 'cause the sun was shining and the ground had started to dry; neighbors aren't sons and they can see only too well when weeds start blowing in the wind. My review of Redeeming Daisy by Tanya Hanson is one the front page of Nights and Weekends at the moment! How cool is that! And I'm frantically trying to slide a review of Little Madhouse on the Prairie by Marion Elizabeth Witte under the deadline for next month's Poetic Monthly. Meanwhile one of the classes at the Muse Online Conference is about writing better book reviews and I'm finding it very helpful. Other classes include publishing pitfalls, how to plot a novel, dos and donts of submissions, what is Christian horror, and many many more. The Muse is great, the time is weak, and the week is rapidly passing... But if you're a writer and you're not musing this year you should certainly consider it for next year. It's online, you can study at home, and the price is FREE! And today I started attending the Muse Online (week-long) conference. Yet more great talks, forums, chats, handouts, and even pitches. Of course, that "May to October" thing kind of messed up my plans to pitch. Finishing various stories in time to write queries was one of my tasks that got put off for the sons' graduations and never got done. Still, I did finish off my first ever romance today, which is surely an achievement. I'll try to clean it up during the week and see if it might find a home somewhere.